Hiking in rainy weather is no fun unless you have the right equipment and clothing. A high-quality rain jacket is essential in wet conditions because it keeps you dry and thus warm. Furthermore, it also protects you against the wind and reduces the wind-chill effect. In this review we selected the best hiking rain jackets to make your buying decision a little easier. In the selection we only listed rain jackets made of top-tier waterproof/breathable materials which provide superb breathability and weather protection. Furthermore, they are also very light and therefore great for hiking, backpacking, mountaineering and similar outdoor activities. We explain waterproof/breathable materials and their characteristics in more detail in the What is important section below. Rain jackets in this review are not inexpensive but they are a good investment due to their high quality. If you are in doubt whether to buy a rain jacket or a softshell jacket also check out our review of the Best Softshell Jackets. This selection includes primarily men's products. For women's products check out the Best Rain Jackets for Women. 1. 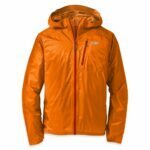 Buying a Hiking Rain Jacket – What is important? 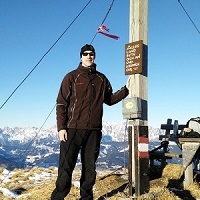 Outdoor sports like hiking, mountaineering and climbing require lightweight gear, because lightweight gear does not only allow you to move faster, but also delays exhaustion. To learn more about why it is important to use lightweight gear for hiking, check out our article Why hike lightweight. Because a rain jacket is often carried in your backpack when the weather holds dry, it should also pack small so that it does not take too much space. 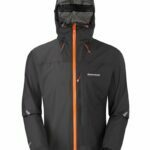 In this selection of the best hiking rain jackets we only listed well-packable and lightweight products. Hiking rain jackets are made of so-called waterproof/breathable materials (also referred to as WPB materials). Some manufacturers use well-known materials from textile brands such as Gore-Tex, eVent and Pertex while others develop their own materials like for example Marmot (NanoPro) or Patagonia (H2NO). These materials use either laminates or coatings. Laminates (membranes) offer better breathability than coatings but on the other hand they are also more expensive. Rain jackets which use coatings are typically inexpensive, but coatings don’t provide as good water resistance and breathability as laminates. In either case the fabric is typically also DWR (Durable Water Repellant) treated so that it repels the water and doesn’t get soaked. To learn more about waterproof/breathable materials check out the Hardshell section in our Comparison of Shell Materials. To see how waterproof/breathable materials compare to each other in terms of water resistance and breathability check out the infographic in our article Rainwear: Hydrostatic Head and Breathability (MVTR). Hiking rain jackets can be made of 3-layer, 2.5-layer and 2-layer waterproof/breathable fabrics. Note that these layers are bonded together and can thus not be seen with the naked eye. 2-layer fabrics have a face fabric and a coating or a membrane, 2.5-layer fabrics have a face fabric, a coating or a membrane and a non-fabric lining, and 3-layer fabrics have a face fabric, a membrane and a fabric lining. 3-layer rain jackets are typically very durable and thus great for alpine climbing, mountaineering and expeditions. 2.5-layer rain jackets are very light and pack very small. Therefore, they are perfect for hiking and backpacking. 2-layer rain jackets are usually relatively heavy. However, there are exceptions such as hiking rain jackets made out of the Gore-Tex PacLite material, which is super lightweight but only consists of two layers. When fabrics are sewn together, small needle holes are created – which would be problematic for rain wear if unmitigated. To avoid such leakages, manufacturers use special waterproof seam tapes to prevent the rain from seeping through the seams. In some cases, manufacturers even weld the fabric panels together instead of sewing them. This technique decreases the weight of the garment and increases water-resistance. Garments that are made by welding fabric panels together are usually very expensive. As a rain jacket is worn as the outer layer, it should be equipped with at least one easy-accessible pocket for storing essentials. Every rain jacket should of course have a fully-adjustable hood which fits your head perfectly and does not disturb you. Some rain jackets have a helmet-compatible hood. If you are planning to do mountaineering or climbing of any sort, we recommend purchasing a jacket with a helmet-compatible hood. Average Weight 1 lb. 15 oz. 6.3 oz. 8 oz. 13 oz. 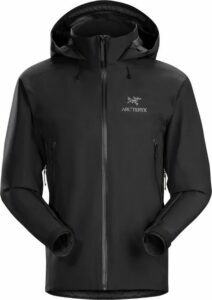 The Arcteryx Beta AR hiking rain jacket is made of the 3-layer Gore-Tex Pro material which, in addition to being very durable and abrasion-resistant, offers great breathability and water-resistance. The Gore-Tex Pro material utilizes an ePTFE membrane which is bonded to both the face fabric and lining. The face fabric of the Arcteryx Beta AR rain jacket is a 40-denier plain weave nylon face fabric. This material is known for having a very good strength-to-weight ratio. It is also DWR treated to repel water. The lining is breathable, lightweight and abrasion-resistant. The jacket’s seams are taped with Gore seam tape, which significantly increases the water-resistance without making the jacket bulky. 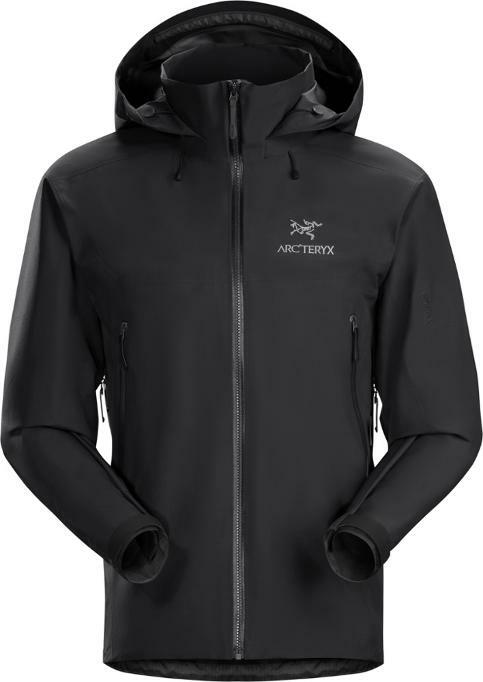 In addition to its top-tier material, the Arcteryx jacket has a helmet-compatible hood, articulated elbows, hem drawcord and two zippered hand pockets. The hood is fully adjustable and features a tall collar for full coverage. 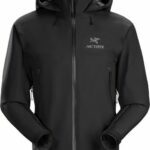 All in all, the Arcteryx Beta AR rain jacket offers great performance and is thus one of the best hiking rain jackets currently available. 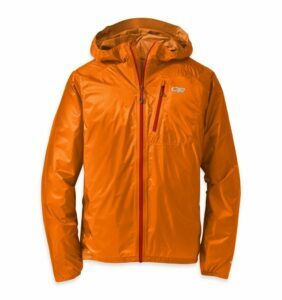 The Outdoor Research Foray hiking rain jacket is very breathable and thus highly popular among hikers and mountaineers. 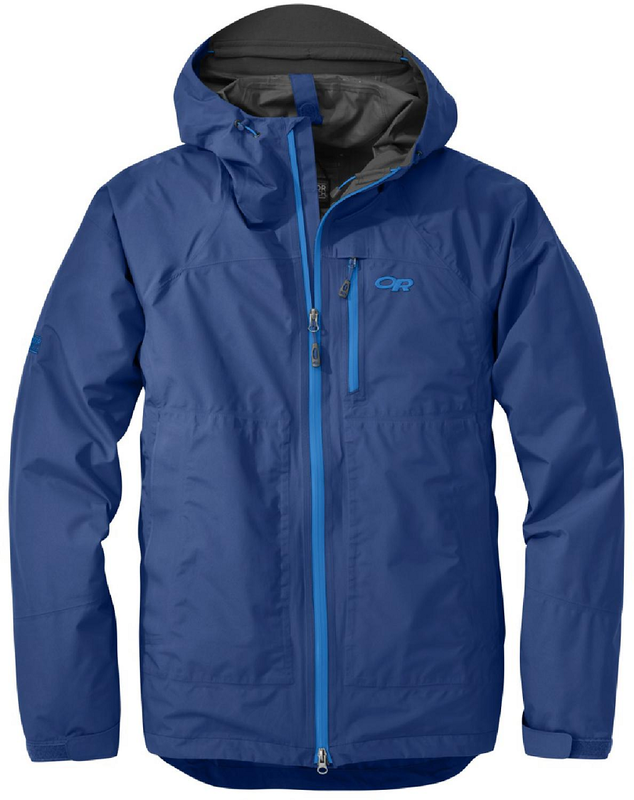 The jacket is made of the 2-layer Gore-Tex PacLite material which is slightly less durable than the Gore-Tex Pro material (used in the Arcteryx jacket above) but a great choice for highly aerobic activities such as hiking and mountaineering. The Outdoor Research Foray jacket is made with taped seams and waterproof zippers for increased weather protection. Other features include a fully adjustable hood, two zippered hand pockets and one zippered chest pocket. The hand pockets are well-placed and allow easy access even if you are wearing a climbing harness or a backpack (with hip belt). 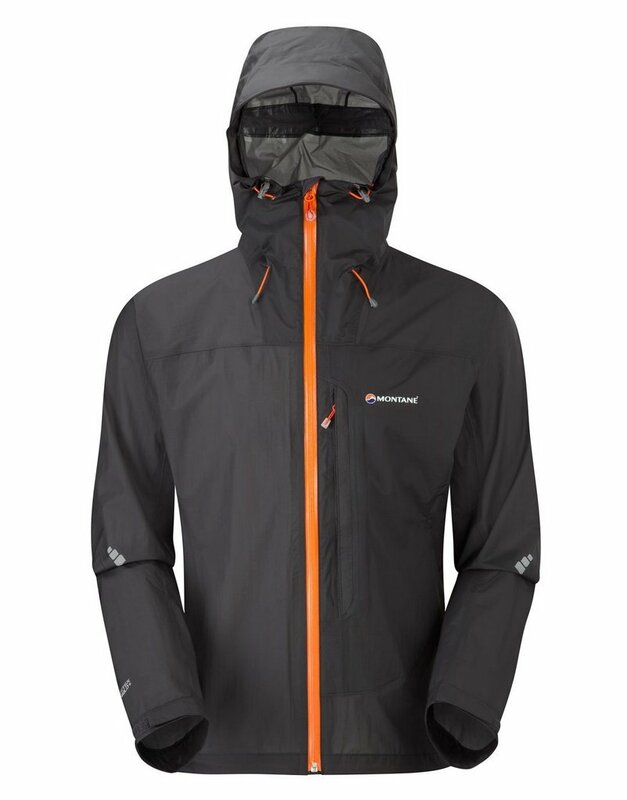 The Outdoor Research Axiom is a great rain jacket which is best for those who need very breathable rainwear for their aerobic activities. 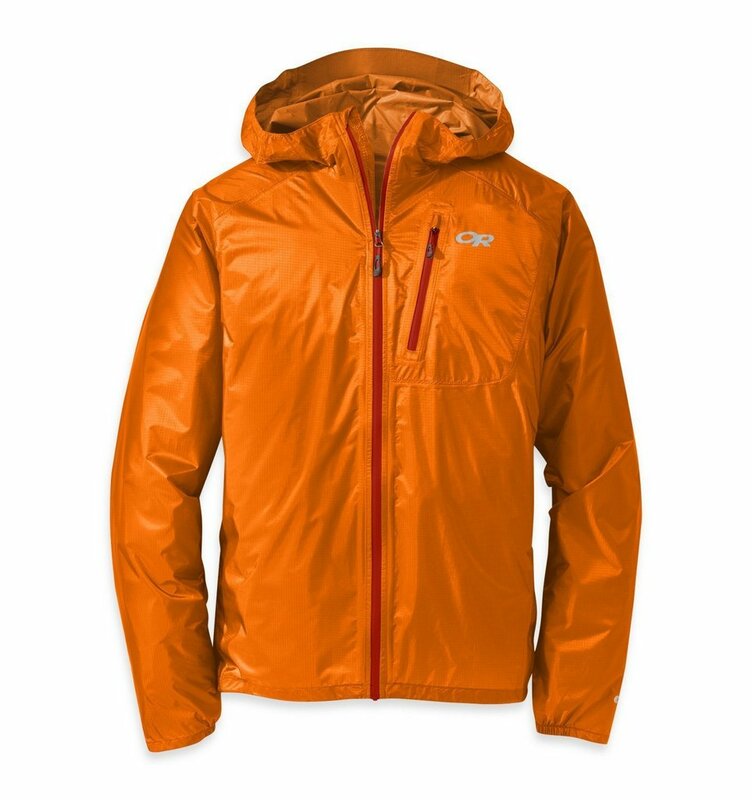 The Outdoor Research Helium II waterproof jacket is extremely light (it weighs merely 6 ounces) and thus perfect for those who prefer lightweight backpacking gear. The jacket is made of a 2.5-layer Pertex Shield+ material (laminate/membrane) which combines good wind and rain protection with excellent breathability. The Pertex Shield+ material has a hydrostatic head of 20000 millimeters and breathability of 20000g/m2/24hrs which is indeed impressive. 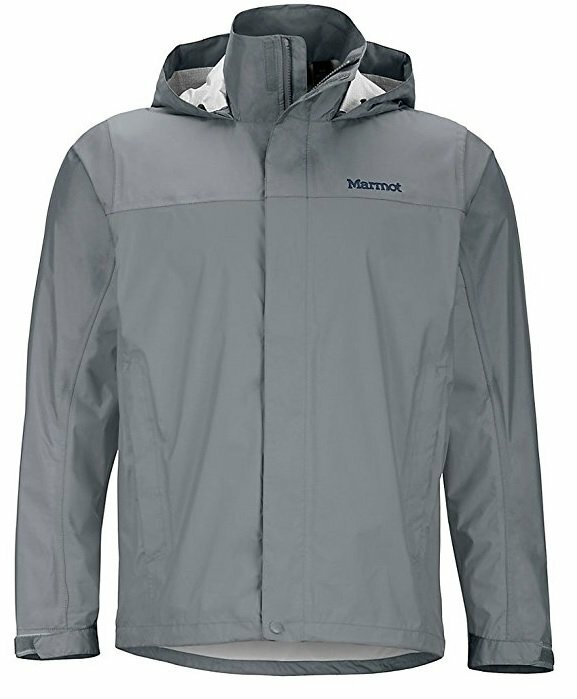 In comparison, the highly popular Marmot Precip jacket (listed below) has a hydrostatic head of 10000 millimeters and breathability of 11500g/m2/24hrs and yet it is known for good weather protection and breathability. The Outdoor Research Helium II waterproof jacket is also equipped with a fully adjustable hood, taped seams, YKK AquaGuard zippers, elastic cuffs and a drawcord hem. For storing essentials, it has one easy-accessible zippered chest pocket. It can also be packed into the internal pocket for easy transport when not in use. The Outdoor Research Helium II waterproof jacket offers great performance while being super lightweight and therefore it is best for those who need ultra-light yet reliable rainwear. The Montane Minimus is another very light waterproof jacket which offers superb functionality. The jacket is like the Outdoor Research Helium II made of 2.5-layer Pertex Shield+ material and thus it offers similar breathability and weather protection. The Montane rain jacket is equipped with articulated arms, helmet-compatible hood, adjustable cuffs, and one zippered chest pocket. The hood can be rolled together and locked away in the internal tab if you don’t need it. In addition to that, this waterproof jacket features a high-quality full length YKK AquaGuard front zipper and an adjustable hem (drawcord) which allows you to tighten the jacket at the bottom to reduce heat loss. For easy packing and carrying, the jacket comes with a stuff sack. The Montane Minimus hiking rain jacket shares many qualities with the Outdoor Research Helium II jacket above but is slightly heavier. 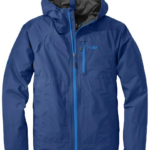 Nevertheless, it is one of the best hiking rain jackets currently available. 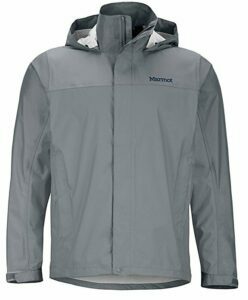 The Marmot Precip waterproof jacket differs from jackets listed above by using a coating instead of laminate to be waterproof/breathable. Therefore, this waterproof jacket is slightly heavier – it weighs 13 ounces. However, it is one of the least expensive jackets in this review. The jacket is made of NanoPro material which has a hydrostatic head of 10000 millimeters and a breathability of 11500g/m2/24hrs. Such numbers are very impressive for coating technology. Additionally, the waterproof jacket has an elastic hem (drawcord), pit zips, Velcro cuffs and a hood. The jacket doesn’t have AquaGuard zipper but uses a storm flap instead. 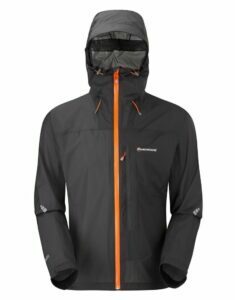 All in all, the Marmot Precip jacket is a great choice for those who just need some basic weather protection for backpacking or everyday use. 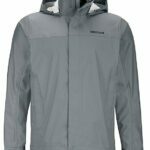 What is the best material for a rain jacket? The best materials for rain jackets are currently Gore-Tex, Polartec NeoShell, eVent and Pertex. These materials provide good water-resistance but are also very breathable. No, Gore-Tex is not completely waterproof. No so-called waterproof/breathable fabric can be completely waterproof. There is always a tradeoff between breathability and waterproofness and since jackets for hiking must be breathable (otherwise you would soak in your own sweat), they can’t be completely waterproof. How do you waterproof a jacket? You should spray the jacket with DWR (Durable Water Repellant). Many different DWR sprays are available and they ensure that the jacket repels the water rather than absorbs it. Note that the DWR should always be applied to a clean garment (after washing).